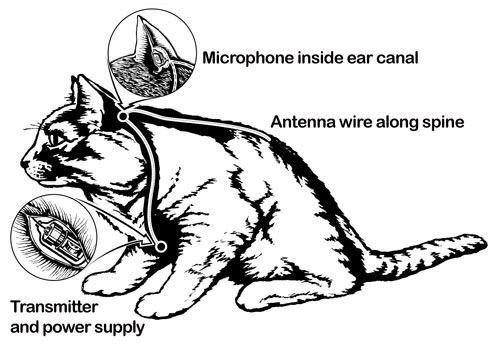 “But…Transparency would stop things like this.” Photo: Spycraft: The Secret History of the CIA’s Spytechs, from Communism to Al Qaeda. Maybe this is why the CIA fought tooth and nail against the release of a nearly 100-year-old invisible ink recipe (that was not even an American document and was already widely available on google scholar); asserted to a judge that its history of the Bay of Pigs invasion could not be released because it could “confuse the public;” illegally destroyed video tapes of its agents waterboarding a man 83 times; and, most recently, had its records disposition schedules stealthily removed from the National Archives’ website (only to be re-exposed later). 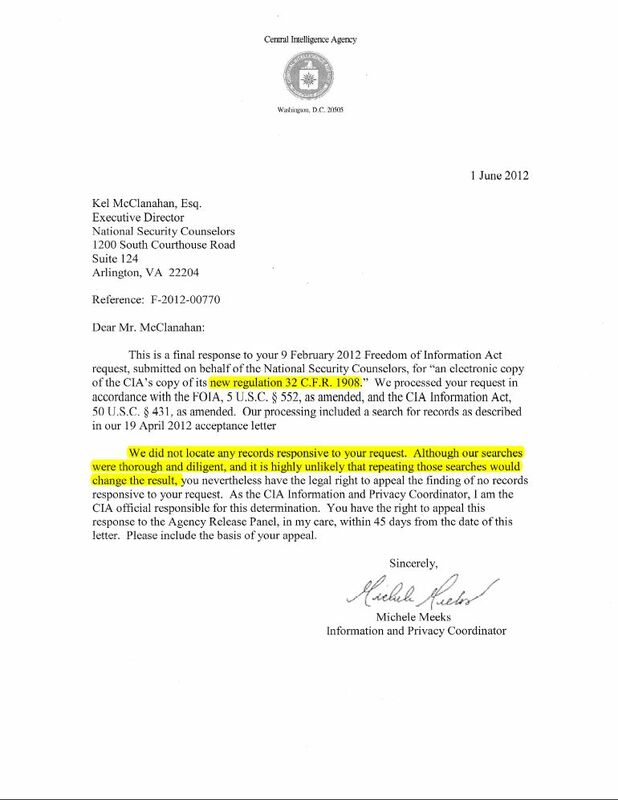 The CIA –according to its response to a Freedom of Information Act request by Kel McClanahan of National Security Counselors– “did not locate any records responsive to your request [for published CIA regulations about declassification].” The Agency claims that “our searches were thorough and diligent, and it is highly unlikely that repeating those searches would change the result.” Wow. Michele Meeks (or whoever processed this FOIA request) is really earning her paycheck. McClanahan likely requested this easily findable document in an attempt to force the CIA to comply with 5 U.S.C. § 552(a)(3)(B) which requires agencies to provide electronic copies of documents to FOIA requesters, if they ask for them. The Agency simply refuses to follow this law. National Security Counselors is currently suing the Agency over this, and other, breaches of the Freedom of Information Act. ** The “missing” document describes the procedures that the Agency must take while processing requests to declassify documents. I’m not joking. Not withstanding the dark humor of this Catch-22-esqe response, it serves as another in a long list of examples proving that the CIA is not following the law as estabished by the Freedom of Information Act. I believe that the primary reason that the CIA flouts the law and complies so poorly with FOIA and MDR is that it fears that transparency will lead to accountability. **Unfortunately, federal agencies frequently ignore the clear law of the Freedom of Information Act –in more ways than just missing their deadlines. Here’s one of the most egregious cases: The Open Government Act of 2007 amended the Freedom of Information Act to state, clear as day, that “No fee may be charged by any agency…if the agency fails to comply with any time limit [in the FOIA].” Well, in 2008 the Department of the Interior attempted to charge a requester for a request that it did not process inside FOIA’s time limit. The requester sued and, eventually. won in court. But Attorney General Eric Holder’s Department of Justice defended this blatant disregard of the Freedom of Information Act all the way to the bitter end. Until the DOJ stops defending agencies’ abuse of FOIA, it will continue to be FOIA’s chief impediment. There’s no likely about it. You hit the nail on the head; I completely filed this request to show the Court how ludicrous the CIA’s position regarding electronic records was. FYI, the version on the CIA website that you linked to is not the current copy. Those regs are the version that preceded the September 2011 amendments. So they can’t argue that the record I requested is on their website. Well, even if they were, a “no records” response would still be wholly inappropriate. The Agency would have to either withhold them or Glomar their existence.